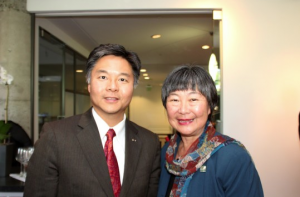 SACRAMENTO — The Veterans of Foreign Wars during a Capitol reception on May 8 named State Sen. Ted Lieu (D-Torrance) and Assemblymember Mariko Yamada (D-Davis) as Legislators of the Year. “State Sen. Lieu and Assemblymember Yamada have been instrumental in advancing veterans’ programs in California and we are pleased to recognize their hard work and achievements on behalf of the veterans of our state,” Earl Fulk, commander of the VFW in California, said. Founded in 1899 and chartered by Congress in 1936, the VFW is the nation’s largest organization of war veterans, with 2.1 million members in 7,700 VFW posts worldwide. The VFW and its auxiliaries are dedicated to “honor the dead by helping the living” through legislative initiatives, youth scholarships, Buddy Poppy and national military service programs.